Smartphones of today are the ultimate example of the convergence of technology. These devices act as a camera, music player, video player, internet communications device, a phone and, in relation to this post, a powerful torch. Yes, one of the most common uses of the camera’s LED/Xenon flash is as a torch. Now, a developer over on XDA-Developers has found a novel use for it: as a sort of notification for incoming calls! Check it out after the jump. 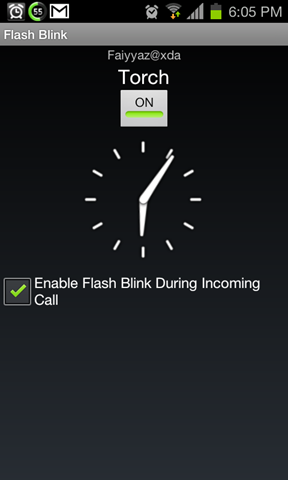 Flash Blink is an application which can be used as a torch plus it give an feature of getting notified with the Camera Flashlight during a incoming call. We’ve tested the app on a Samsung Galaxy S II on Android 4.0.3 ICS and can confirm that it works as claimed. 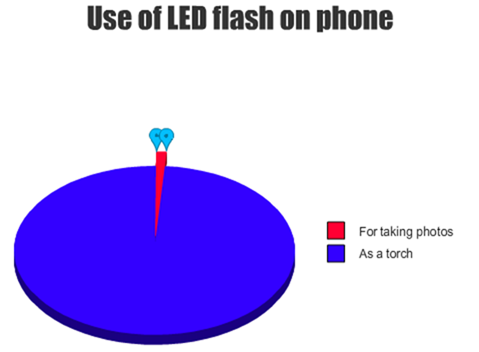 The torch functionality as well as the flash-on-incoming-calls feature both work the way they should. After launching the app, users are presented with two options/toggles: to turn on/off the Torch and, of course, enable/disable flashing torch on receiving incoming calls. That’s really all there is to the app. I wish the app would allow user to set time when to enable/disable flash as a notification for incoming calls. I would prefer the flashlight to be activated after I go to sleep so that it comes easy to locate the phone in a dark room. To install the app, you must first enable Unknown sources from Settings > Security so that you can sideload FlashBlink onto your device using its APK. After downloading the APK, simply tap it to begin installation. Don’t forget to let us know what you think of FlashBlink by leaving a comment over on our Facebook and Google+ page.